Spaghetti squash, named after the famed Italian pasta, is an easy fruit to grow that is very appealing on the dinner table. From seed to harvest, here is everything you need to know to grow your spaghetti squash well and have great harvests. Depending on the climate in your area, February-March is the right time to start sowing spaghetti squash under cover in nursery pots followed by transplanting when the last frosts are past, or you can also wait for direct sowing starting from the month of May. Spaghetti squash fears the cold, and requires warm to hot climate to germinate properly. Spaghetti squash loves rather rich soil, feel free to amend the soil with compost or fertilizer before planting. 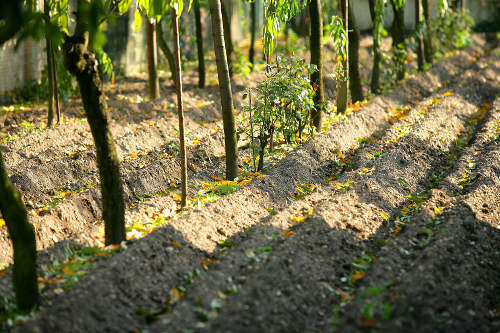 It is also possible to sow directly in the ground, starting from the month of May, if the area is prone to mild fall seasons. 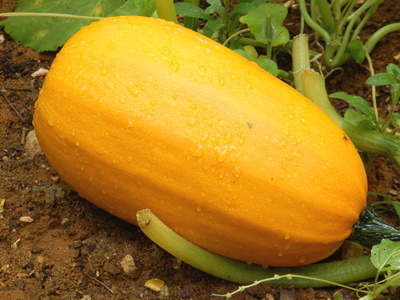 Spaghetti squash requires rich soil to produce a nice harvest. Loosen up the soil well before before sowing spaghetti squash. 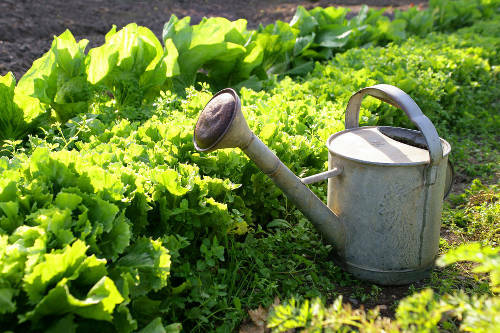 Once your spaghetti squash have grown well, mulch their base to keep the soil moist and cool. Mulch also keeps the spaghetti squash from touching the ground thus avoiding the risk of fruit rot. Spaghetti squash needs water to develop well, especially in case of heat and/or extended dry spell. The right time to harvest spaghetti squash is when its color is bright yellow. The color of the spaghetti squash is a great indicator to know when it is mature. A second sign is that the spaghetti squash must have a perfectly smooth skin. Each plant produces between 3 to 5 squash that can weigh from 2 to 4 kg a piece. When harvesting, keep as much of the stem as you can to extend preservation. Harvest your squash spaghetti before the first frost spells. After the harvest, spaghetti squash can keep for several months, in a dry room with a temperature ranging from 50 to 60°F (10 to 15°C). 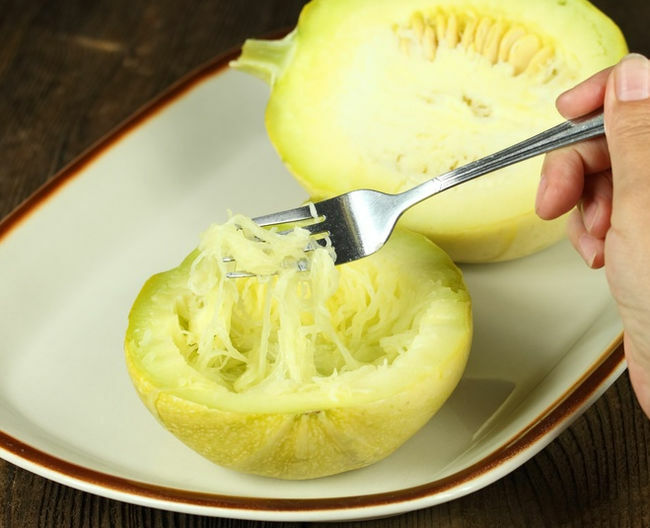 Avoid storing the spaghetti squash in a moist room because this considerably shortens its keeping. As soon as any spot on the spaghetti squash softens up, remove it and eat it immediately. It belongs to the Cucurbitaceae family, of which it is most probably one of the most remarkable members. Indeed, this “spaghetti” gourd has a unique flesh that contains long strands that are very similar to the famous Italian pasta when cooked. Its flesh isn’t particularly savory or exceptional compared to other squash, but its surprising spaghetti-like shape made it famous. You’ll be treating children and adults to a true surprise when cooking this gourd, and preparing it in exactly the same manner as you would real spaghetti. With low calorie levels and high vitamin C content, spaghetti squash also has demonstrated antioxidant properties. Note that spaghetti squash seeds are perfectly edible and, once dried, are a perfect addition to mixed salads or served with salt for appetizers. Take care not to let too many fruits develop on a single plant (at most 5), or you might reduce the quality of the entire harvest overall. Growing squash and gourds easy tutorial – pumpkins, too!